Some days ago we wrote about Saints Row: Undercover, the cancelled PSP game revealed by Volition during one of their weekly Twitch Streams. Today you will be able to play the prototype yourself: the lovely people at Volition created a playable ISO for the Undercover prototype and shared it with us to be preserved and archived. There are 3 mirrors at the moment, in case one of them doesn’t work anymore let us know in the comments below! The prototype is fully playable on PC with a PSP emulator as the PPSSPP, if you are able to use it on a modded console let us know (here a guide that should work, they were also able to play in multiplayer on PSP)! As we wrote before, please show Volition your support, follow them on Twitch, Twitter, Tumblr and Facebook, if they will get enough good feedback then in the future they could show even more lost games that are still hidden away in their archives! Last updated by monokoma at 09-02-2016 . 6.61 PRO-C Modded PSP 2000 gives an error while trying to run the game. Error (8001002). I think the game will only run on the firmware its dev kit ran. Trying to play it on my modded PSP that can play PSP ISOs and sadly does not work for me, I keep getting a game could not work error. I’ve tried this on a modded PSP Go (6.20 PRO B-10), unfortunately, no luck. Game crashes instantly. Works fine on PPSSPP. how ??? i ve got the game iso file and this emulator and it wont load …. I don’t have my PSP on hand to try it out on native hardware, but if you’re having trouble, it seems to run fine in PPSSPP, at least in my experience. Give that a shot if you can! What is the error? I have a devkit on the latest fw and of course the sdk; I’m licensed and such.. give me more info, I will see if I can load it on my DTP-H1000A or even my less cool DTP-1500A. Both of those are put away (about to move) but I may have to dig out some boxes labeled “devkits” after seeing this. So can’t be played on a PSP, only PC? Dunno why they haven’t compressed it. Managed to get it to 32mb with 7zip. Please use some other host. Mega isn’t doesn’t like my connection very much. Mediafire is great. So… its legal if I host it? They released it freely, so yes. Btw ya really should post the checksum to recheck. It seems that many have problems here with the file. I’m trying to get the checksum but 7zip is acting up for me and keeps popping up with “Operation is not supported”. Happens with other archives too that weren’t even compressed by me. I’ll look into it later today. Sorry about that, I’m not an expert so I just used default settings with compression level set to ultra. As for legality of hosting, I actually don’t know but I’m sure they don’t really care seeing that it’s a cancelled game for a dead platform. Much kudos and love for the great devs who shared this with us. And here we are: http://faloo.de/SRUPSP.ISO (431,54MB) & http://faloo.de/SRUPSP.7z (57,70MB) direct download. Wow, Volition… way to earn my support of you as a developer. I haven’t played any of your games yet, but that’s changing now. Just amazing! A direct link is important or not? So keep an attention of your finger buddy! Try to set-up the controls and push buttons at the start screen to make it goes to the main menu! That doesn’t work for me. If you keep pressing X you eventually get to the menu. I downloaded and installed the modified version and it crashed after selecting “new game” on my 3004 with 6.60 PRO-C fix3. HOWEVER, updating to firmware version 6.61 and installing 6.61 LME-2.3 solved the problem and the game now works just fine! The game seems to be only a few fixes here and there away from being production ready. Thanks Volition, Unseen64 & Borman! hi, can you post your working iso? Anyone had any luck getting this to run on a proper PSP? The game loaded to the Undercover title screen when I tried it on PPSSPP on my Nexus 5, on the PSP Go (only one I’ve tried at the moment) it read the game as in my library but when launching it would crash back to the XMB. Haven’t yet tried on the other PSPs / a PC. Great! Thanx to the dev(s). Maybe the eboot is encrypted? Decrypt it and rebuild the .iso. Then try again on your console. Will try it later today myself. Tried it on a PSP-1000 FW 5.50 GEN-D3. No go. I get the same Error (8001002 as others have. Will give it a go using PPSSPP. Someone in the know mentioned that it probably won’t run on a retail PSP as it probably hasn’t be optimized for it yet. As the Dev boxes and an emulator have more memory then a retail PSP. So maybe that’s it. I think the developers tried to troll us with a fake prototype, since the only thing appears (at least in a emulator) is the title of the game and nothing more. It’s basically a virtual brick and a giant middle finger for all the people who downloaded this piece of crap. The link to their twitter in the article goes to their twitch page. Fyi. If you’re having issues running it on PPSSPP, go to Settings>System and change it from PSP1000 model to 2000/3000 and it should work fine. Just tried it on my GS5 with PPSSPP. I originally got the main menu and when I wanted to start a new game it crashed. Now it works. Also, with PPSSPP if nothing is happening, tap x a couple times the screen should eventually blink and once more after that than you get told to hit start and then you should be good. PSP 2000 CFW 6.20 PRO-B8: Error 80010002. PSP 2000 CFW 6.39 PRO-B6: same. PPSSPP Android: crash after selecting “Start Game”. PPSSPP Android: same crash as before. Every time I try to download it my Mac locks up! Volition seems to have a fair number of practically complete prototypes floating about the internets, anyone remember money shot? Got to play the XBLA build of that one, good stuff. which makes me wonder if Volition’s execs realizes they keep killing off practically complete games, I wonder what else they’ve failed to take my money after spending all that money to make. Which were your posts? I see 8 messages from you in this page! I just discovered this site. Are there other beta/cancelled games with downloads here? 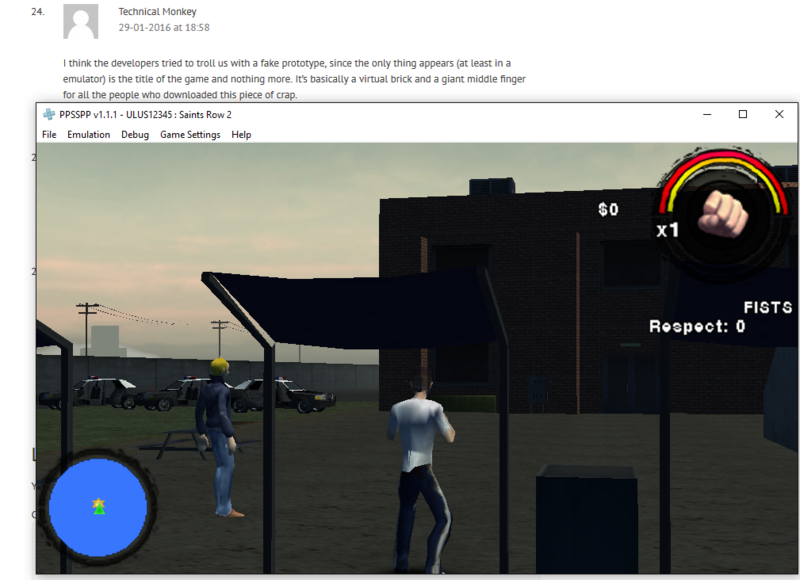 For me,Saints Row: Undercover looks like early GTA III prototype. Tested working on PSP 3001 with light CFW. You simply create an eboot the same way as you would a PSX game. I actually have it 100% WORKING on a CFW PSP 3000 Brite 6.60 PRO-C2! when youre on the XMB press the select button and change youre UMD ISO mode to M33 Driver and it works like a beauty! It’s probably a build configured to use extra memory available on devkits but not on retail devices. That’s common during development, since budgets are often missed and you still need to debug things. I did not make the last post in my name, linking to a download file. Is there someone at Unseen64 I can send a working file to directly, so people don’t pretend to be me? Again, this is tested and working on PSP 3001 (the silver one, if that matters any) with LCFW using a PSX eBoot program. The eboot.bin and boot.bin they refer too in the linked article are different file sizes and the boot.bin isn’t even in there? Does not work on PSP Go! even after doing the EBOOT thing it crashed the console when loading. Ok got it to work on my psp thanks to another site. First do the boot.bin eboot.bin swap like in the post earlier. Then you have to use a firmware where you can enable “force high memory layout”. Ypu can find that option in the recovery menu, advanced settings. how did you get it to run? The iso doesnt seem to work on cfw or ofw psps. But the eboot pbp file works on both. Works on my cfw psp 1000. I do not believe, but there are still new PSP games. Can my PSP 3000 6.61 LME work? Its not working on PPSSPP FOR ME. The gun store kind of works. You can see some guns, but can’t buy them.